In December 2011, there was an end, not to Phil Collins’ official fanclub but to the monthly updates of the online archives. So it is worth while looking back what the membership has brought their paying fans … or may bring.. When Phil Collins’ official web presence disappeared overnight in 2006, the official statement explained that, with no solo activities at hand, there was no reason for an official website. They focused on the then not-yet-defunct Genesis website that offered a special fanclub area you had to pay for in time for the reunion. Unfortunately, those who gave in and paid did not get very much for their money. Many fans were more than disappointed with what was offered. The Genesis website went off-line soon enough. 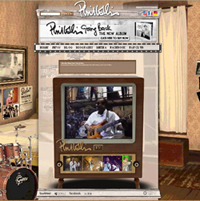 After the tour and the release of the box sets their management did not see the point in maintaining a web presence. 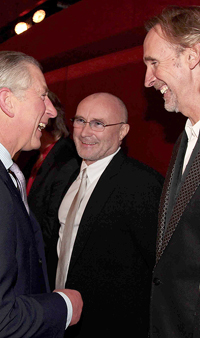 But lo and behold, Phil Collins gave it another go in 2010! Just in time for the promotion of his Going Back album there appeared a new official website, and it did not take long for a fanclub subscription model to appear. Many fans who remembered the fiasco with the official Genesis website fanclub felt less than inclined to fall into that trap again. So the number of those who can actually judge whether the subscription was worth the monthly fee is not too large. The initial fear that we would only get B-sides and video clips that had already been released proved unfounded. All of the 23 demos, two early rehearsals and 11 live tracks have not been released before. The audio streams and downloads are/were available as 128kps MP3 files, except for * (320kps) und ** (256kps). Two rehearsals from Phil Collins’ youth were a big surprise. The first was an eight minute Drum Solo (2 takes)** that he allegedly recorded himself in 1964 when he was 13, the second was the Ron & Phil Jam**, an eleven-minute session recorded in 1970 with Phil Collins on drums and Ronnie Caryl on the electric guitar. Both would soon audition for the free jobs in Genesis. Fans of the Face Value period got no less than eight demos. In The Air (demo)* is, basically, just the unedited version of the Drawing Board B-side of the If Leaving Me Is Easy single, albeit in a slightly different mix. It Must Be Love (demo) has fairly finished lyrics, but it is accompanied only by a drum machine, Rhodes piano and synth strings. Roof Is Leaking (Instrumental Demo) is pure piano without vocals. Latin Marimba (Hand In Hand Instrumental Demo) is stripped down very much, too, just drum machine, piano and synth. Unlike the Drawing Board demo, I Missed Again (Instrumental Demo) has real drums and is closer to the album version, though it has no vocals. Don’t Break My Heart (I’m Not Moving / Me & Virgil Demo) is a very interesting track that combines parts of I’m Not Moving with the “Pa, you broke a heart” part from the later Genesis track Me & Virgil. It has drum machine, piano and incomplete vocals by Collins. 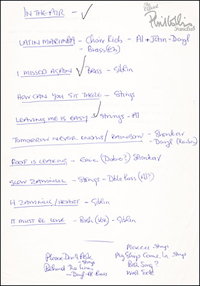 Unlike the Drawing Board demo, If Leaving Me Is Easy has neither any vocals nor Clapton’s guitar. How Can You Sit There (Against All Odds Instrumental Demo) is an early version of Phil Collins’ 1984 hit with piano and synth sounds. There are also some demos from the second album Hello, I Must Be Going. Through These Walls (Demo) has the feeling of the finished song, but Collins sings his incomplete lyrics over drum machine and synth only. On Don’t Let Him Steal Your Heart Away (Demo) Collins sings dummy lyrics (except for the title line) and accompanies himself with piano, synth strings, and, in the second half, a drum machine beat. The same instrument plus piano plus synth sounds and bass make up the basis of Westside (Demo), where, surprisingly, Collins sings what will become the saxophone line. Oddball (Do You Know, Do You Care Demo)* has been previously released; it still lacks the lyrics and the powerful drums. No demos have been known from No Jacket Required so far. Now there are three demos of classics from the album: Sussudio (Demo)*, One More Night (demo) and Take Me Home (Demo) already have the drum computer beats and the later keyboard arrangements, but Collins’ lyrics are incomplete except for a few key lines. Watch The Clock (Demo)* is a hitherto unknown ballad with piano that may perhaps be from the …But Seriously era. The lack of demos is made up for with a number of live tracks from the Serious tour (in soundboard quality). We do not know whether they are all from the same concert. The list includes: Against All Odds*, Doesn't Anybody Stay Together Anymore, All Of My Life*, Do You Remember*, Something Happened On The Way To Heaven*, Another Day In Paradise*, Seperate Lives, I Wish It Would Rain Down*, The West Side, That's Just The Way It Is* and Heat On The Street*. Since much of the original demos was used for the Both Sides album there is not much to loot here. Can’t Find My May (demo)* has a drum machine instead of real drums. Let’s Go Out Tonight (Please Come Out Tonight Demo) does not differ much from the later version. Another song that did not make it to the album was Deep Water Town (Demo). It is a balladesque piano piece with synth blankets and quite complete lyrics. The most recent demos come from the Dance Into The Light album. The arrangement of Dance Into The Light (Demo) is quite sophisticated, though it does not sound that great in its all-synthetic version. The same goes for Wear My Hat (Demo) and It’s Everywhere (Demo) that was later released as a non-album track. A brief Fanclub Welcome Message introduces material from concerts and interviews from different periods. Interview & Stuff is a brief interview made at the time when No Jacket Required came out in 1985. The ten-minute Eric Clapton Band Special Interview from 1986 focuses on his work in Clapton’s band but also on Genesis and his solo activities. The 80-minute Live In Berlin Part 1 is the TV version of the legendary 1990 show that is also available on DVD. It includes Hand In Hand, Hang In Long Enough, Against All Odds, Don't Lose My Number, Inside Out, Do You Remember?, Who Said I Would?, Another Day In Paradise, Separate Lifes, Saturday Night And Sunday Morning, The West Side, That's Just The Way It Is, and Something Happened On The Way To Heaven. Next up are concert cuts from the Both Sides tour. The tracks from Live In Bangkok are from the show at the Thai Army Stadium on March 27, 1995, interestingly, without Daryl Stuermer: Don't Lose My Number, I Wish It Would Rain Down, A Groovy Kind Of Love, Both Sides Of The Story, Hang In Long Enough, Easy Lover, Something Happened On The Way To Heaven, Knockin' On Heaven's Door, Two Hearts, Against All Odds. Live In Peru has more tracks from the show at Estadio Nacional in Lima (04/25/1995): I Don't Care Anymore, Everyday, Another Day In Paradise, One More Night, We Wait And We Wonder, In The Air Tonight, Find A Way To My Heart, Only You Know And I Know, Sussudio, You Can't Hurry Love, Take Me Home. US Tour Int contains a 13-minute interview made before the start of the Dance Into The Light tour in early 1997. You can also watch Wear My Hat Rehearsal Part 1 and Drum Solo (Wear My Hat Rehearsal) from the rehearsals for the same tour. 1998 is covered by a brief Big Band Interview and a Big Band Rehearsal. NYC True Colours Rehearsal Footage may be from the same year. The uncut Testify Interviews Part 1, 2, and 3 amount to more than a hundred minutes of viewing time and take us into the new millennium. 30 minutes of Making Of Can’t Stop Loving You is a 2002 documentary about the video production. Finally, there is the Heatwave Lyric Video that shows the official 2010 clip with lyrics. The gallery section of the online fanclub offers a wide collection of photos and documents, some of which have not been seen before. Private childhood snapshots, photos with VIP and celebrities as well as impressions from Phil’s home and collections can be seen here. There are also a number of interesting scans that show handwritten lyric/song sketches. Some of those can be downloaded in high resolution: Please Don't Ask, In The Air Tonight (4x), It Must Be Love, I Missed Again, Slow Zawinul/You Know What I Mean, Leaving Me Is Easy (2x), Face Value label sketch, Face Value tracklist sketch, Lonely Man/Man On The Corner, Sussudio and I Wish It Would Rain (2x). Other „exclusives“ are a fanclub interview with the collected answers as pdf download, various competitions, a permanent rebate on orders from the official online shop, the welcome set (a letter, a patch and a membership card). In October 2011 an online forum was added, which was public but did not have much traffic. Most fanclub members will have been quite contented with what they got for subscription fees of 30 EUR (20 EUR for the second year). The management seems to have learned from the disastrous experience with the Genesis fanclub, and they have not been stingy with offers and material. Of course there are some thing that ought to be improved: The fan support is very anonymous and not very good at all. If you have questions or note issues in the download area you have to wait for a couple of days to get a reaction. Some wishes and suggestions, e.g. higher quality downloads, are simply ignored. It seems quite obvious that the site admin/support do not know their Collins stuff: The information that accompanies images, audio and video streams is very vague and at times plain wrong. Everybody who believed that Phil Collins would perhaps participate in the blog or even the forum was in for a disappointment. If that was not important for you, you probably enjoyed the monthly updates. Obviously some of the “exclusive” material has leaked out, but the luxury and the advantage of a membership consists in getting stuff first and not having to collect everything in the wide expanse of the World Wide Web. Though there will be no more content added to the archive, newcomers will get access to the complete material. It is unlikely, however, that any more material or activities will be forthcoming.